Two small presses, one blog: all the latest news and views from your favourite publishers, Jamie McGarry and Emma Wright. Phillipa Barker, who is currently doing work experience with us, interviewed Leanne Radojkovich, author of First fox, on her pamphlet, the definitions of flash fiction, and her experimental work! 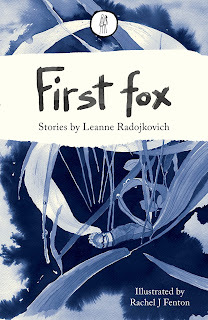 What were your influences, literary and otherwise, when writing First fox? One influence was Shaun Tan’s magical figurines and story retellings inspired by Grimms’ fairy tales in The Singing Bones. These seem so simple, yet are hypnotic and thought-provoking. I wondered how I could make contemporary stories infused with a similar feel. I was attracted to ideas in Max Lüthi’s The European Folktale which outlines features commonly found in the tales such as a compact, abstract style and a story world where the supernatural and the everyday are collapsed into the one dimension. Some factors he mentioned felt really natural and I realised I was already using them such as writing with a matter-of-fact tone, minimal exposition, and an openness to mystery and wonder. But I hadn’t tried using fairy tale motifs like a talking animal, sudden transformations (man-into-rat), or unexplained appearances (people materializing out of a wall). I also wanted to try unnamed protagonists; the mother, the boarder, the very old woman. The stories have a dreamlike fairy tale quality to them; 'Once upon a time, not so long ago, Mother, Mila and the cat arrived in the new country.' Was this intentional when you were writing them? Yes, I wanted to place a modern refugee or migrant story in a traditional fairy tale structure to see what might happen. I’d been haunted by Joy Williams’s exploration of Audobon’s dark side in Baba Iaga and the Pelican Child; and Dubravka Ugrešić’s take on attitudes to women and ageing in Baba Yaga Laid an Egg. Juxtaposing fantastic and ordinary elements in these stories seemed to light up the storyscape in an oblique, witchy way that affected me more deeply, I feel, than if they’d be told more realistically. The natural world features heavily in the collection; 'The verandah was surrounded by paw paw trees, banana plants, frangipani – a creamy flower dropped to the ground and its perfume floated in the humid air.' Was landscape important to you when you were writing the stories? I love the natural world, just the ordinary domestic one of sparrows, weeds, spiderwebs, fruit trees. Also, I like placing characters in the moment; and bringing their environment to life is one way to do this. The attention to detail is beautiful; 'Across from her, the mother has damp, roughly cut hair and a cold-porridge complexion. She too has almond eyes, but no make-up. Her only jewellery is a silver charm bracelet with a miniature horseshoe, a pair of dice and a heart-shaped clasp.' Is this important to you when bringing the story and characters to life? Physical details were important for that story because it juxtaposed the present-day mother with the memory of herself as a teenager. Usually, I’m more interested in a few sharp details about a character’s environment, than their appearance, as I like the sensation of looking out at the world through their eyes. Did you have a collection in mind when you started writing your stories, or did you write them first and decide on the collection after? I was writing some of these stories when I saw the Emma Press call-out for a prose m/s. I just thought I’d try my luck by sending in a selection that seemed to fit together. Do you tend to plan your stories out before you start to write, or do you start writing from an idea and see where the story takes you? I usually get a strong feeling which I can’t explain, as time goes on ideas grow out of that feeling, when enough ideas have evolved I start writing them down and the story comes into view. Your flash fiction street art has travelled all over the world. How long can a flash fiction piece be before you class it as a short story? And vice versa, how concise can a short story be before it slips into flash fiction? I was interested in flash as I love the question of scale: how much story can exist in a tiny space? I took two excellent online flash courses with Fish Publishing and learnt heaps about trying to create very small structures that evoke much larger ones. In this way, the writer and the reader become a real team; as it’s the reader who rounds out, or completes, a flash story. In terms of word count, I can only fit stories under 250 words on my PinUps frames, but I’ve also written stories up to 700 words long that also rely on gaps. Once I get over that mark I find I’m working with story layers, instead, which I consider short story territory. You use Youtube, SlideShare and physical pinups, to quote your website, that 'have appeared on shop windows and park benches, in phone booths and public loos' worldwide, as a way of sharing your flash fiction. Do you see yourself as experimental in the form? I like experimenting with different platforms, for the fun of it really. And I’m very attracted to the free art movement, the idea of seeding art around the place for anyone to enjoy, ignore, or chuck in the bin – it doesn’t really matter. Art doesn’t have to be about making money or a career – it can also be about creating something unusual or beautiful or funny; and giving it away. It also means you don’t have to wait for permission in order to send a story out in the world. You can publish them online whenever you like and network them to an audience via social media. A huge percentage of the world’s population has a mobile phone and enjoy browsing content. Readers and writers can respond to one another in realtime, and grow online eco-systems. Also, the analytics are amazing – you can truly see stories circulating around the world. One of my little stories on SlideShare has had ~2,000 views plus 1,000 on YouTube. There are also offline methods of distribution like putting up posters of stories or poems. I’ve had fun with what I call PinUps, which are framed photos I’ve taken of a flower, a cactus, a pigeon, for example, with a story pasted on the back. I then leave the frames in a public space – Blu-Tacked to the walls of alleyways, gutters, band rotundas. Friends have also taken them on travels and they’ve ended up in far more glamorous spots like the Riddarhuset (House of Nobility) in Stockholm, Rome’s Spanish Steps, and a Chairman Mao statue in Shanghai. What made you choose the Emma Press over more local New Zealand publishers? I really loved the Emma Press’s poetry pamphlets – how fresh and vibrant the poetry was, how lovely the design and production values. I’d long dreamt of having stories in an artisan press collection just like one of these pamphlets. I was so pleased when Emma Press opened the door for prose submissions. I sent in a manuscript and was beyond thrilled when they said yes. I’m writing short stories, they take place in the here and now, and this time there are no fairy tale motifs. First fox is available to order on our website. You can also find out more about our call for prose and poetry pamphlet submissions here.